He was being compared to Eddie Stanky, because of his short, stocky, build. But he also played the game with a reckless abandon like Stanky, and was given the moniker “Scrappy Jack.” He was also referred to as the “The Hammer,” if for no other reason than it was an abbreviation of his surname. 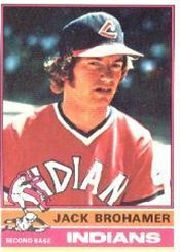 But on June 9, 1972, Cleveland’s rookie second baseman Jack Brohamer demonstrated for the miniscule crowd of just over 7,700 customers at Cleveland Stadium why he was deserving of both nicknames. The left-handed hitting Brohamer smacked solo home runs in consecutive innings off Minnesota starter Bert Blyleven. They were the first two round-trippers of his big-league career, coming in the third and fourth innings. They provided all the offense Gaylord Perry would need in winning his tenth game of the year, striking out 11 Twins in the 7-1 win. Perry also went deep, hitting a two-run homer in the fourth inning. With a runner on second in the top of the sixth inning, Rod Carew singled to center field. The hit plated the Twins’ only run. Harmon Killebrew was the next batter and he hit a grounder to third baseman Graig Nettles who threw to second where Brohamer forced Carew. But as he made the pivot, the Twins second baseman upended Brohamer, sending him airborne. Jack did a cartwheel, falling to the dirt basepath with a thud. He had failed to get the throw off to first base. He stayed in the game, although a bruised thigh forced him to the bench in the bottom of the seventh inning. “It was my fault not getting out of the way,” said Jack, who also nursing a cut near his mouth. “He just did his job trying to break up the play.”2 A little tumble would not keep Brohamer on the pine for long. “Scrappy Jack” was listed on the lineup card the next day. John Anthony Brohamer was born on February 26, 1950, in Maywood, California. He was the youngest of four children in the Brohamer clan. His father worked as a machinist. After graduating from Huntington Beach High School, Brohamer was selected by Cleveland in the 34th round of the June amateur draft. Brohamer singled in his first at-bat, and was 3-for-5 in his first full game. His average generally declined, from .298 at the end of May to .262 at the end of July. The long season caught up with him, and he ended the year hitting .233. He trailed only Horace Clarke of New York for assists (393) by American League second basemen. Jack was awarded for his fine year, as he was named to both the Topps and Baseball Digest rookie teams. He came to spring training the following year, reportedly overweight. He suffered through some leg injuries, sharing time at second base with Tom Ragland. During 1974 spring training, Angel Hermosa beat Brohamer out for the keystone job. But on May 11, Hermosa suffered a ruptured medial ligament in his left knee, via a collision with Baltimore’s Don Baylor. Brohamer stepped in, went 2-for-2 at the plate to finish the game and never looked back. His work paid immediate dividends a week later. On May 19, it was “Jacket Day” at Cleveland Stadium against Detroit when Brohamer went deep in the first game for a two-run homer off of Mickey Lolich. It proved to be the only runs Gaylord Perry needed in a 2-1 victory. In the second game, Brohamer’s bunt single in the bottom of the fourth inning scored Frank Duffy to break a 2-2 tie, a game the Tribe eventually won. He hit a career-high .270 for the season. He also led all second basemen in the junior circuit in fielding (.987). Behind the Perry brothers who won a combined 38 games, the Indians were in the race, only 6 ½ games off the pace on Labor Day. But they faded as the season played out. Aspromonte was relieved as manager and replaced with Frank Robinson, the first black manager in the major leagues. Robinson held a tight competition between Hermosa, Brohamer, and rookie Duane Kuiper. Both Robinson and General Manager Phil Seghi thought that second base was one position that needed to be upgraded. However, as luck would have it, Brohamer met the same fate as Hermosa the year before. On May 25, which was Dennis Eckersley’s first career start, Hammer suffered a severely bruised left hip when he tried to break up a double play against Oakland. The hip healed, but there was an infection in the joint. Kuiper was recalled from Oklahoma City, and played well. Jack was out of the lineup for almost two months, and it seemed as if it was the beginning of the end for Brohamer in Cleveland. Kuiper, also a left-handed hitter, played an exceptional second base as well. At the winter meetings, the Chicago White Sox front office was looking for a strong fielding second baseman, especially strong on the pivot. Jorge Orta was their second baseman in 1975, but the thought was to move him to third, as Bill Melton had just been traded to California. The White Sox had just obtained Larvell Blanks from Atlanta. On December 12, 1975 a deal was made, and Brohamer was headed to the White Sox for Blanks. With Bucky Dent at shortstop, he and Brohamer formed one of the better middle infield combinations in the American League. At the plate, Brohamer posted his career highs in home runs (7) and RBIs (40). The White Sox though finished last in the western division with a 64-97 record, second-worst in the major leagues. Richards was replaced with Bob Lemon for the 1977 season. Owner Bill Veeck went out and made some trades and purchased a free agent with a big stick to try and boost the team’s anemic offensive attack. Richie Zisk and Oscar Gamble were acquired in trades, while Eric Soderholm signed on as a free agent. When the new acquisitions were mixed in with Chet Lemon, Jim Spencer, and Lamar Johnson, the White Sox were given the nickname “South Side Hitmen.” They hit 192 homers, second in the majors to only Boston (213). The new look White Sox contended for most of the year, finishing in third place (90-72), 12 games behind division winner Kansas City. Brohamer was shelved until mid-May with a prostate infection. By the time he returned, Orta again solidified his hold as the starter at second base, while Brohamer was relegated to utility duty, as he was stationed at both second and third base. He did make his mark on White Sox history, when on September 24 Brohamer became the second player to hit for the cycle. He went 5-for-5 at the plate, scoring twice and driving in four runs in Chicago’s 8-3 win over Seattle at the Kingdome. The last White Sox player to turn the trick was Ray Schalk on June 27, 1922. “Bob Lemon was the manager, and after I‘d hit a homer, two doubles, and a single in four times at bat, before I went to the plate the fifth time he told me, ‘If you hit the ball, don’t stop running until you get to third base,’ and I didn’t.” 8 His hit to lead off the ninth inning was indeed a triple to center field. Brohamer signed a three-year deal with Boston, beginning in 1978. He was once again given the “utility player” tag, as he filled in at second and third base. At times, he was even penciled in as the designated hitter on Don Zimmer’s lineup card. The Red Sox were in a fight with New York for the division crown all season. Boston closed the season on a 12-3 run, forcing a-one-game playoff with the Yankees. Third baseman Butch Hobson had developed bone chips on the inside of his right elbow. It was painful for him to make strong throws, which occurred every time he had to make a throw across the diamond to first base. Brohamer stepped in and started at third base the last week of the season. He also started the playoff game against the Yankees on October 2 at Fenway Park. In the third inning and Boston leading 1-0, George Scott led off with a double to center. Brohamer did his part by successfully bunting “Boomer” to third base. But the Red Sox were unable to bring the run in from third base with less than two out. Bucky Dent’s three-run homer in the seventh inning erased a one-run deficit, and New York went on to win 5-4. Brohamer, who was at third base when the ball went out, termed the loss as a “huge disappointment.” Unfortunately, the game, and the homer are part of Fenway Park lore forever. In 1979, Brohamer played in 64 games and hit for a .266 average with 25 runs scored and 11 driven in. In 1980, Brohamer came full circle, beginning the season with the Red Sox, but then being sold to the Indians on June 20. Kuiper had torn his knee up and needed reconstructive surgery. After unsuccessfully trying to fill the role from within, the Indians brought “Scrappy Jack” back to fill the void. He hit .225 in 53 games. He was released in spring training the next season, and was granted free agency. However he was unable to latch onto another team. He finished his major-league career with a .245 batting average in 805 games, and 227 runs batted in to his credit. In retirement, Brohamer worked in law enforcement, specifically as detective sergeant with the Oceanside (California) Police Department. When he retired from the police department, he wrote a monthly article for a local magazine, rating golf courses. As of early 2013, Jack is semi-retired, living with his wife Helene, whom he married in 1967. They have two sons, Jack and Greg. Helpingstine, Don. South Side Hitmen (Charleston SC: Arcadia Publishing, 2005). Kahn, Roger. October Men (New York: Harcourt Books, 2003). Brohamer,Jack. Interview with author, November 2012. 6 The Sporting News, May 31, 1975. 7# The Sporting News, May 1, 1976.